Thanks for making VIDEO EDITOR MASTER one of the most popular app on the app store. •	Capture frames while streaming videos using our Frame Grabber for capturing a single frame at a time or use In-Depth capturing for 10 frames at a time. It is an amazing application for making a movie and editing the clips on windows platform. Video Editor Master supports UWP(universal windows platform) with user friendly interface and unique video filters. It makes very simple to edit your video clips with a single touch on devices. It can also create slideshows of your media files such as images, pictures and soundtracks. 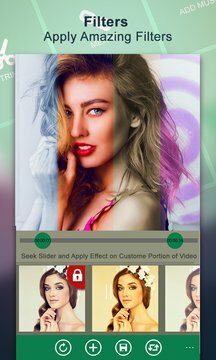 And there are lots of magical features in the app like video trimming, merge video, text on videos and cool video effects. •	Simply adding media files and getting a beautiful movie. •	One touch sharing on social media. 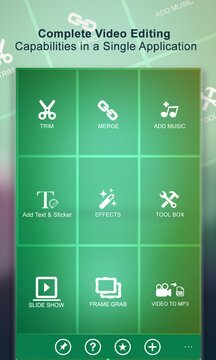 •	Add music files in background to complete your video story. •	Fading effects and stylish text designs. •	Add various transitions for creating dynamic movies via in-app purchases. •	Special Premium feature offers extended video editing. •	Directly create and share custom video size clips on social platforms. •	Advanced functionality for core users. This is an application with easy to use functions based on universal windows platform and equipped with wide range of tools for improving video quality. Video editor also supports multiple resolutions and HD quality videos in 480, 720 and 1080 pixels. Download now and start doing editing like a professional!